Base layers are so vital to comfortable hiking and I live in my Icebreaker Cami. Icebreaker is a company selling New Zealand Merino wool products. I have worn this cami on every hike since November, sometimes two days in a row without washing it in between. What is amazing about it? It doesn’t trap and hold on to stinky, smelly sweat. I’ve read many a review about this product and real women claim they go for days intensely backpacking and it just doesn’t smell. Washing is easy, gentle cycle and hang it up. Hand wash it, if backpacking and hang it off your backpack to dry. The straps are easy to adjust, I just worry about the plastic rings breaking on the strap at some point, but it is a heavy plastic. This ring doesn’t rub or irritate me when wearing shirts over it, you know seam lines can rub. A backpack is very comfortable over it. The cami doesn’t ride up and bunch under the other clothing or backpack. I’m not yanking it down to my waist every few feet, I hike. It has a cute floral design, very subtle and not overpowering to the garment. Though I don’t really see the design because it is usually hidden under a few layers. On the trail I have had to change layers and gone right down to the cami in very cold weather for a few seconds and it was comfortable, not allowing my core to freeze. I plan to pick up another one for the summer, this time one with a shelf bra. That way in extreme heat, I can just wear that and still be modest. The wool is NOT itchy in any way and stays refreshing, pre, during and post hike. If I was a backpacker I would make sure I had one on at all times and another to rotate with it. 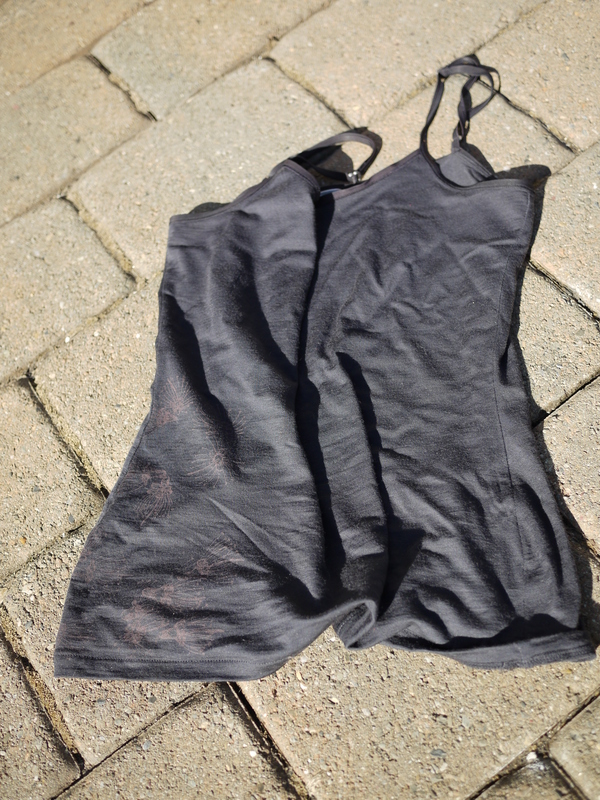 If you are backpacking with others they will come to appreciate you wearing this cami after many miles.